Last Thursday, I defended my life. Yet, still, I think the idea of this being a defence of one’s life isn’t all that imprecise. After all, writing the thesis has been my life for the last four years, and especially as it has brought on an entirely new sort of life within a ‘foreign’ country, the thesis has been the central point around which my life has orbited in that time. However, this was by no means a ‘trial’ of any sort. At least not like I thought it would be. I blame this solely on my examiners. In fact, were I to describe my experience with the Viva, this close to the aftermath, and in a single word, it would be: demythologised. Then, and with just a hint of irony, you might find yourself, years later, sharing similar wisdom to your own younger siblings/cousins/friends/acquaintances. This is not unlike the advice you might receive from colleagues who have passed through the viva stage. However, in this iteration, the message seems a bit more constructive than the ‘dose of reality’ you might get from the previous description. In fact, one of the predominant advisements I’ve received over the years about the viva was: It’s nothing to be afraid of. That’s nonsense, I’d proclaim. How could it not be something to be afraid of? Here is the culmination not just of all your time working on this one particular project, a close and critical examination of 100,000 words wherein typos are bound to happen and arguments might seem less developed than someone might want, but, perhaps more frightening, here is the culmination of years, a decade, maybe more, of research and studying and moving from university to university, city to city, country to country. Here is the last and final defence you must make to prove that you are worthy to join that extremely elite club of individuals and thus earn the title ‘Dr.’ Is this not, of all the things one must do within this movement up the academic ladder, the quintessential thing to be afraid of? Someone once put it to me this way: as a kid, when you were playing video games, what is scarier, getting through the first level, which might seem hard at the time, or spending hours/days/weeks/months playing through a game, getting to the final boss, and realising if you lose here, everything that came before would be in vane? That, to me, seems like something worth being afraid of. When I’d hear the ‘it’s nothing to be afraid of’ line I thought it simply did not pertain to me. It was something one merely said in the euphoria that followed the viva, usually spoken by individuals who appeared physically and emotionally exhausted, driven half-mad by that final battle, a piece of their soul left somewhere behind. These were the type of thoughts that preceded my own experiences with the viva. As I blithely stated above, I blame much of the demythologisation here on my two examiners. I somehow got quite lucky by having the two individuals that I had personally chosen, and were at the top of my list, to be those who would read, examine, critique, and discuss the thesis with me. Not only did I select these individuals because I thought their backgrounds fitted the topic and contents of the thesis, but because I respect them above all others as exemplary experts in their fields. What this produced was an examination less like a defence, and more like a discussion, as if somehow we had each colluded to transform the final hurdle in my race to doctorship into an engaging and quite beneficial supervisory meeting. Thus, even when we disagreed on points, there was a congeniality underscoring the criticisms, each suggestion filtered through a respectful means of assisting me in making the thesis the absolute best, and thus clear and definitive, text it could possibly be. Though the final verdict requires corrections to be made within the text, and though this means I did not ‘ace’ the thesis (those in my inner circle here have taken to calling this the ‘Whitney,’ based on the results of a genius colleague’s stellar viva result), I have come away from the experience not just invigorated about addressing these corrections, but with a newfound admiration for the topic itself. In other words, because my examiners did such an impeccable job, I’m spending these immediate days after the viva neither exhausted, nor wishing to remove myself as far from the thesis as possible, but excited about the prospect of making it all that much better. First, as I was preparing myself last Thursday morning I was trying to remember a quote from Hemingway about the fear one might have of writing. For whatever reason it kept popping up as I read my Introduction and Conclusion for the fourth time, like a half-memory that my brain kept trying to link to my argument. ‘Come out to the office,’ I said. We came back into the room and sat down at the table. Hemingway is telling his friend, in his own way, to ‘forget his personal tragedy,’ to move beyond those things that might have caused his anxiety and diminished his confidence, to let go the myth that he has anything to be afraid of. Which brings me to my second conclusive observation. Leading up to the viva I was told a number of times that the experience was nothing to be afraid of, that I would ‘do fine.’ While this advice did, in fact, come true, it is not something I find myself able to adopt. I suppose, like all those times when as a young man someone gave me sage advice about the realities of the real world, I am once again dismissive. Not in a rude or negative sense, mind you, but in a practical way. 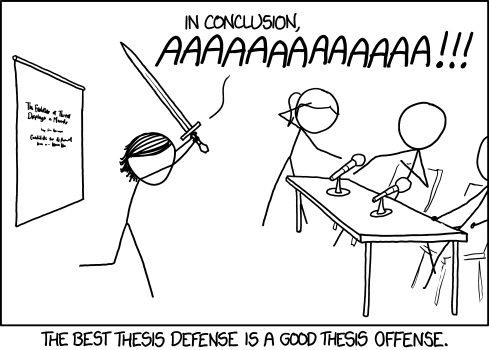 Yes, my viva experience was wonderful, and better than I could have even imagined or day-dreamed it in order to pacify my anxiety, but I also think the mythology of it was necessary too. Much like how Fitzgerald’s myth about the poorness of his writing forced him to ensure it was always clean and detailed and perfect, were it not for my fear of the viva, perhaps I would not have been as prepared as I was, or, more importantly, perhaps it would not have been such a rewarding experience, simply because that reward came from the demythologisation of it. In other, and final words, were I asked what to expect from the viva by a colleague approaching their own, because my fear of it proved so useful to the outcome itself, “it’s nothing to be afraid of” is something I’m afraid I just couldn’t say.